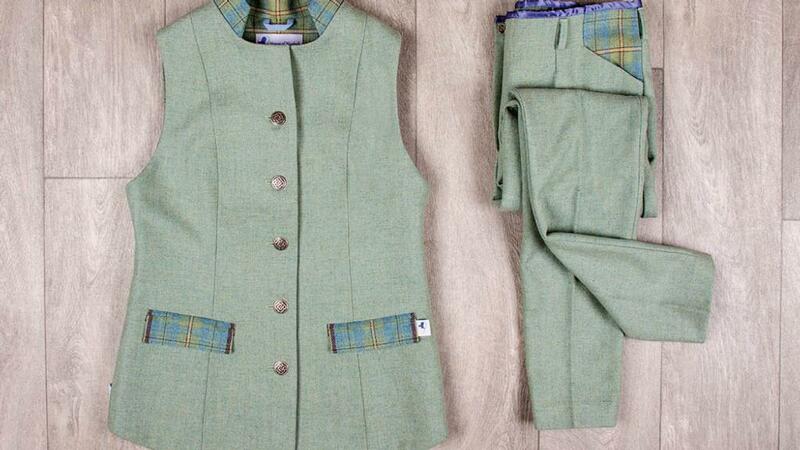 Scottish farmer Wendy Crawford combines farming with a signature fashion line that is growing. Kate Chapman visits the face behind the House of Bluebell. When farmer and e n t r e p r e n e u r Wendy Crawford struggled to find clothing suitable for curvier women, she took matters into her own hands and started her own fashion label. Wendy, who manages 1,000 Cheviot sheep and 140 Friesian bullocks and Highland cattle with husband Matthew on their farm in Cardenden, Fife, taught herself how to tailor, then began making her own exclusive tartan pieces from fine, pure wool fabric. 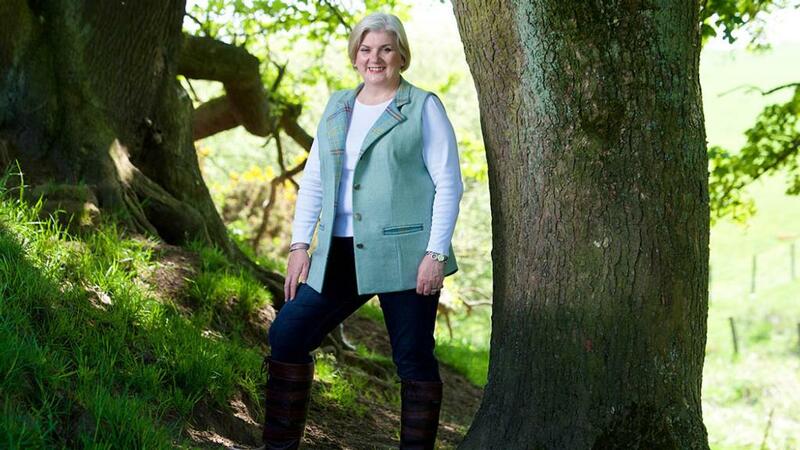 She launched House of Bluebell from the family’s 140-hectare (346-acre) farm in 2016, after creating a range of trousers, jackets, waistcoats and skirts, which she describes as an elegant addition to any wardrobe – rural or urban. Her venture has gone from strength to strength. And now, as well as adding new colours and accessories, she is also exploring overseas markets too. “I’m a very practical Fifer and when I have an idea I just want to get on with things,” she says. “On the farm, we produce fine wool from Cheviot sheep and it has always frustrated me Scottish textiles don’t get the full recognition they deserve,” explains Wendy, who has a degree in biology and previously worked for Cancer Research before setting up her own IT training support business. What does the future hold for British wool? After she graduated from Glasgow Caledonian University in biology, Wendy’s job took her all over the world and she spent many years living in London working for Cancer Research before setting up her IT business. But following the break-up of a previous marriage, she returned to Scotland with her two sons. She moved on to husband Matthew’s farm in 2005, where they buy-in sheep, then five years later signed herself up to a 12-month Scottish Enterprise Rural Leadership programme to immerse herself in Scottish politics after being south of the Border for so long. “I was keen to understand things from a Scottish agricultural point of view, having been down south for so long – and especially since English and Scottish politics are such polar opposites,” explains Wendy. “After completing the programme, I began to get a lot more politically involved – especially on issues surrounding wool. “We do not get good prices for our wool and that drew me into the textile industry. “Now I am more curvaceous, I’ve found I cannot get anything to fit me and, as a girl, I remember textiles being so good. We used to be able to get lovely kilts and skirts from the borders, but they are disappearing now. “So I thought I could make some nice clothing, probably raise the profile of the industry and make people more aware of sheep farming. Armed with the knowledge there was a gap in the market, along with business skills she gained while running her IT company, in 2013 Wendy began learning more about textiles and manufacturing. “It’s just so difficult for ladies to get clothes these days and we found a lot of shops on the high street closing and many women don’t really like going into them anyway. “I knew we needed to forge a personal relationship, letting people know our brand would suit them and be a good fit on them. “But I was a complete novice. Coming from Fife, though, I knew a lot of people and quite a lot of factory workers who sewed, although all those traditional skills were disappearing too. Wendy invested several thousand pounds in her label, buying second-hand machines and also recruiting a graduate from HeriotWatt University. The couple send their wool to the British Wool Marketing Board where it is put into the global market and fabric manufacturers pick up what they need “But I was a complete novice. Coming from Fife, though, I knew a lot of people and quite a lot of factory workers who sewed, although all those traditional skills were disappearing too. Learning a traditional craft from scratch has not fazed her, but instead made her determined not to compromise on skills. “I’ve had to learn all about the textile industry and how it works,” she says. “I’ve had to learn about industrialisation of machines and that has been quite difficult. Larger machines are all computerised, but out of our price range, while older industrial machines are very mechanical, so it’s been interesting learning about those. 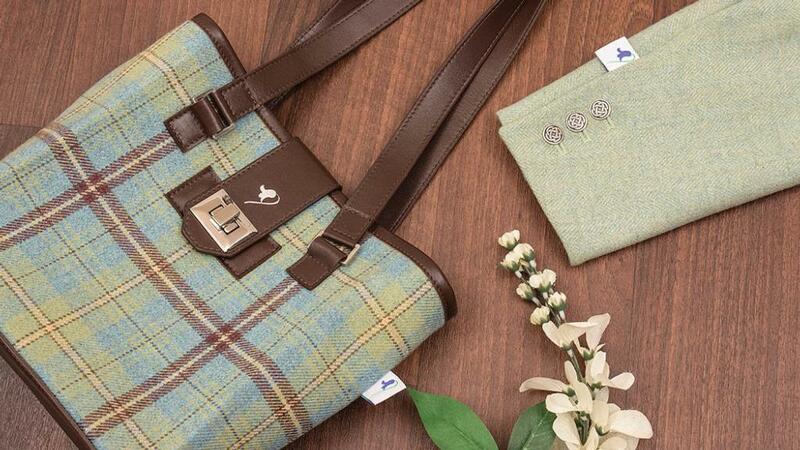 As well as selling her collection online and promoting it through social media, Wendy also took a stand at the Royal Highland Show, where she will be returning this year to showcase a new collection, in red and blue colourways, along with accessories. At the moment, her main client base is in the UK, although some of her pieces have already made it overseas, after tourists from Canada, America and Australia bought them at the Royal Highland Show. As for the future, Wendy is keen to further explore overseas markets after receiving interest during her own visits to America with Scottish Enterprise. She also wants to expand her range further and eventually hopes to provide a tailoring service to offer bespoke garments. As an entrepreneur, she says, you need to be brave. Wendy says: “If you have a good idea, go for it and you do need the backing of friends and family – mine have all been very supportive. “You have to think big and bigger. I think for women that can be especially hard as they tend to consolidate, rather than speculate, due to responsibilities of the family, whether that’s children or parents, as well as run a business." “My boys are older now, so they are helping which is good. We are so close-knit on the farm and, with living and working there, I’m never too far away. “It makes for a far more relaxed atmosphere and when cattle are still out it’s all hands on deck. “I’m 57 and at an age where I’m not afraid to take risks. I took my first ones when I was pregnant setting up my IT business. You learn to do things. “You learn what you’re capable of and go forward. I also think that having worked on a farm has helped, as it has made me more resilient. But there’s no doubt; I’m having a ball.